Late postoperative complications occur more than 4 weeks after surgery. o High IOP can occur transiently for 3-6 weeks after surgery. A succulent bleb and a gonioscopically unobstructed sclerostomy is present. 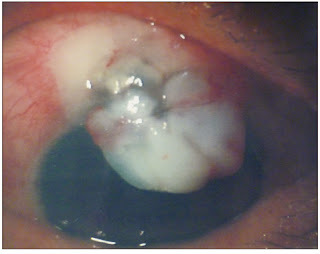 On examination a diffuse, elevated and opalescent bleb with thickened subconjunctival connective tissue and paucity of microcysts is present. This transient IOP elevation is due to temporary swelling of sclera or the collagenous lining of the wall of the bleb (“high bleb phase”) which limits aqueous outflow. o Intermittent digital pressure can be applied to the lower lid. Aqueous suppressants can be given to reduce flow through the bleb as its walls remodel to ultimately allow improved outflow. Corticosteroid administration is also increased to prevent fibrosis. o The condition resolves in a few weeks when aqueous suppressants can be stopped. o Gonioscopy should be done to rule out an obstructed internal sclerostomy. Any tissue blocking can be cut by argon or Nd:YAG laser. o Growth of fibrous tissue across the scleral surface is the commonest cause of glaucoma-filtering-surgery (GFS) failure. In some cases the conjunctiva and Tenon’s capsule form a thick walled (Tenon’s) cyst surrounding the sclerostomy. The cyst is characterized by a dome-like, tense, injected aqueous-filled space within the subconjunctiva. The overlying conjunctiva is mobile. A Tenon’s cyst or fibrous tissue growth across the scleral flap can be incised under visual control at the slit-lamp or operating microscope. o In a failed GFS, a trial of anti-glaucoma treatment is given. If surgery is deemed necessary, another GFS in a non-scarred area is done. Inferior trabeculectomies should be avoided as the failure rates are higher; they cause more irritation and have higher rates of blebitis and post-operative endophthalmitis (POE). In such a situation, tube insertion (Glaucoma Drainage Device) or trans-scleral cyclophotocoagulation (TSCPC) can be attempted. 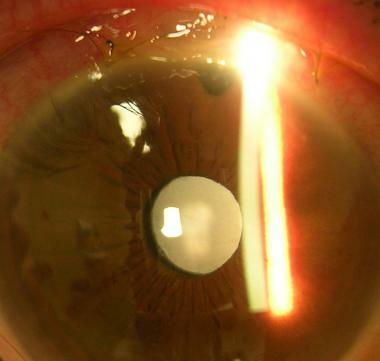 o Cataracts can occur soon after surgery due to surgical trauma. They usually develop as a consequence of BSS hitting the lens from the side-port. 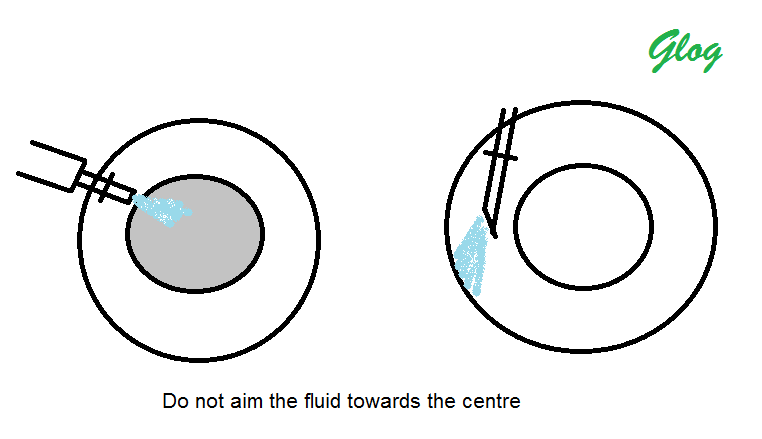 This can be avoided by directing the side-port away from the centre. o Cataract surgery can cause functioning blebs to fail or shrink in size. A clear corneal temporal phacoemulsification should be done in such cases. Posterior synechiae and a miosed pupil may require additional manipulation to enlarge the pupil (e.g. iris hooks). Postoperatively IOP should be monitored closely and meticulous viscoelastic removal should be done intraoperatively to prevent any post-operative IOP spikes. o Most blebs show trans-conjunctival ooze characterized by a positive Seidel’s test. However, these blebs do not require any intervention. In some cases, especially where anti-metabolites have been used, a thin-walled, friable, avascular bleb may show a late leak. Such blebs have a higher risk of POE and hypotonic maculopathy. o Initial conservative treatment of bleb leaks include: pressure patch, topical antibiotic, aqueous humor suppressants and/or placement of a Simmon’s shell or an over-sized soft contact lens to compress the bleb defect. Some experts suggest placing tissue glue directly over the bleb defect or placing a patch on the hole. The glue should be covered with a large diameter CL or collagen shield to avoid glue related complications (corneal abrasion or epitheliopathy). o Direct suturing of the hole/defect might be difficult in avascular tissue, leading to tears of the conjunctiva. If sufficient Tenon’s capsule is present beneath the hole, a compression suture can be tried. Autologous blood injection into the bleb can also be attempted. Argon laser treatment can be done by manually apposing the wound edges while laser burns are applied to weld the edges together (200µ, 200mW, 0.5s). Another technique involves application of argon laser burns circumferentially around the defect after painting the area with Rose Bengal dye, which facilitates laser absorption into avascular tissues (200µ, 100-200mW, 0.05s). However, a persistent leak requires surgical resection and resuturing. o Persistently low IOP ≤5 mm Hg is defined as chronic hypotony. o The causes include: Overfiltration, bleb leak, aqueous humor hyposecretion with/without choroidal detachment, iridocyclitis, cyclodialysis cleft, unrecognized retinal detachment, severe ocular ischemia. 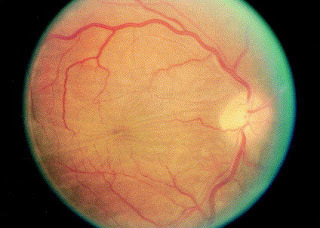 o Risk factors for hypotonic maculopathy: young age and myopia. o Fundus findings: Folding of choroid and overlying RPE of the posterior pole; swelling of the optic disc (unless atrophied or extensively cupped); increased tortuosity and engorgement of retinal vessels. 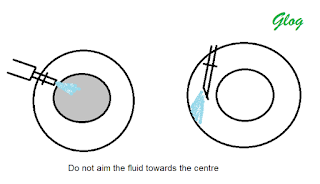 o Management: Treat the cause (bleb leak, choroidal detachment, cyclodialysis cleft or retinal detachment). Aqueous suppressants which can cause late hypotony should be stopped. An extensively large and over-functioning bleb can be reduced by painting with trichloracetic acid; short exposure cryoapplication to the edges of the bleb; autologous blood injection within the periphery of bleb; Nd:YAG thermal delivery to the scleral surface or compression sutures. In case these techniques fail, bleb revision is required. 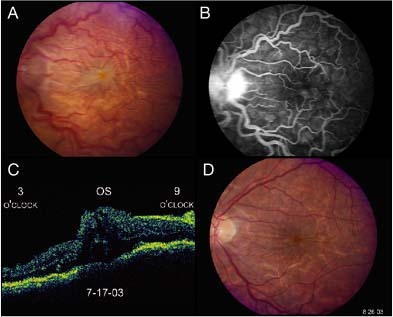 o Late bleb infection/endophthalmitis occurs in about 1% of eyes with a successful GFS. o Risk factors are: thin walled cystic blebs, transconjunctival oozing of aqueous, inferior filtration blebs, blepharitis, CL use, diabetes mellitus, malnutrition and a compromised immune system. o A large bleb may cause a foreign-body sensation. Dellen or bubbles in the tear film may occur anterior to the bleb. Artificial tears or bland ointments can be tried. o A symptomatic bleb present 3 months after surgery can be treated with trichloracetic acid or cryotherapy. Autologous blood injection into the bleb can be done. Nd:YAG (3-4 J with offset at 3-4) can be used to put a few shots on the sclera to shrink the bleb. Excision-resuturing is often required. o Deep dissection of the scleral flap entering the supraciliary space can cause postoperative prolapse of uveal tissue through the sclera.